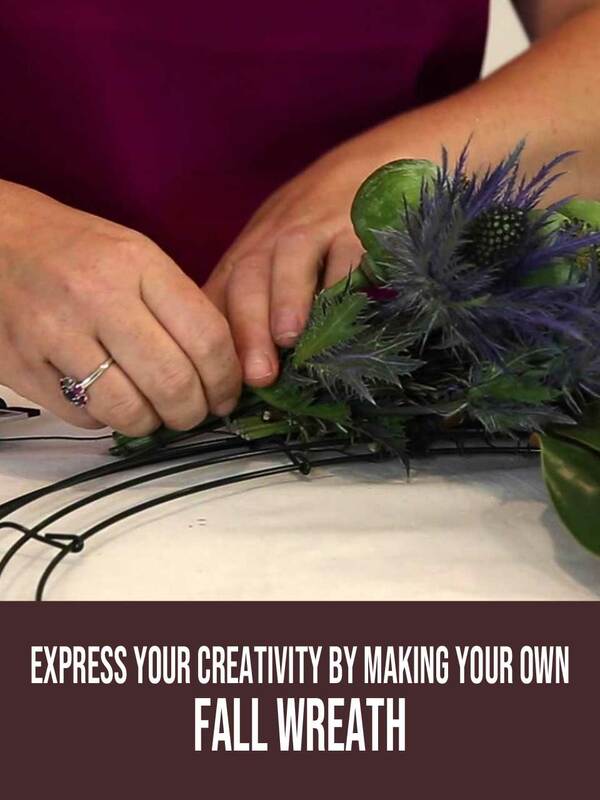 A fall wreath is a great decorative idea that offers you a lot of different ways to express your creativity. In this video tutorial, floral designer Beth O’Reilly shows how to make a fall wreath with fresh flowers and foliages that will dry to last throughout the fall season. Even if you’re new to wreath making, this video will give you all the incentive you need to try making your own fall wreath, along with several tips and tricks you can use to make your project easier. If you love fun, easy-to-do floral projects, you’re going to love this fall wreath video. Watch it and see if you agree. I really hope you enjoyed the video… and can’t wait to give this a shot. As I’ve mentioned before in other posts, the basic technique used to make wreaths is the same. Your choice of materials is all that differs, and that’s what makes each wreath unique. And while we’re on the subject, all of the flowers and foliages used in this fall wreath, including the magnolia foliage, rosemary, scabiosa pods, poppy pods, thistle and fountain grass can readily be bought online. You can find these flowers and foliages at sites like GlobalRose, FiftyFlowers and BloomsbytheBox. These 3 companies are ones that I’ve had personal experience with. There are other online sources that look great too, but I’m only familiar with the ones I mentioned. If you only require a small number of top-quality flowers, I usually just recommend buying them from your local florist. You might pay a little more, but you’ll also save money by buying only what you need. One quick tip, if I may. When using silk flowers, I always recommend staying with fresh greens if possible, as it will help to make your wreath looking more natural. The hardgoods used like the wire wreath frame, paddle wire, and small rubber bands can also be found there, too. Okay, an admission is in order. To be perfectly candid, the main reason this site exists is a selfish one. I love video tutorials (like the fall wreath presentation you just watched), and I honestly just wanted a place where I could re-watch all of my favorites under one roof. I enjoy earning a bit of sponsorship revenue on the side, as I share some of the videos I’ve curated with you. Hopefully, you’re cool with that. So make this a site you return to! I’ll just be sharing more helpful videos with you. They’ll cover subjects such as plants, weddings, and flowers… and a lot more! And as a final note, your input and feedback mean a lot to me. So tell me what you thought of the fall wreath video in the comments section below.